WELCOME TO YOUR NEW HOME at 22632 Beltrees Ct., Land O' Lakes, FL. Location, Location!! 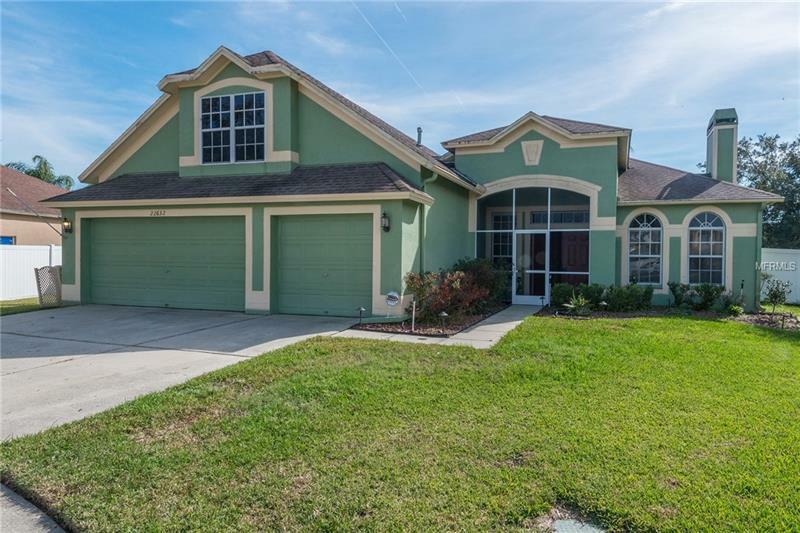 This beautiful home is located in the heart of Land O' Lakes. Easy access to Hwy 75, 275 and The Express Way. Very low HOA fees and NO CDD fees. Great schools and neighborhood. This home features a double door entry that is screened, 4 bedrooms, 3 bathrooms, 3 car garage and a large yard that is fenced with a vinyl fence. Your chef will love this large kitchen that features a gas stove/oven to cook on, spacious living room with a wood burning fireplace. The room upstairs can be used as a 5th bedroom or a bonus room. Whatever fits your family needs best. The home has an over sized screened in Lanai. The AC, hot water tank and dishwasher were all replaced 3 yrs ago. Beltress Ct., is a cul-de-sec and the house sits on a corner lot. This home is a must see. You don't want to miss this opportunity to live in the Sable Ridge community.